Seborrheic Dermatitis In Children Dubai | Does Your Child's Itchiness Require Professional Help? Seborrheic Dermatitis In Children Dubai | Does Your Child’s Itchiness Require Professional Help? Seborrheic dermatitis in children Dubai: Find out how it presents, why it happens & how to treat it! Seborrheic dermatitis in children Dubai: What is it? Seborrheic dermatitis in children Dubai: Seborrheic dermatitis in children is a chronic inflammatory skin condition that usually appears on areas of the body with a large density of sebaceous glands (glands in the skin that produce an oily material sebum for lubrication), such as the scalp, face, chest, back, axilla, and groin. It is a chronic condition and waxes and wanes. It is seen from infancy to adulthood. However, it is commonest in infants up to 3 months. It gradually reduces and disappears by age 4 years. It may be seen in adulthood mainly as dandruff. Seborrheic dermatitis in children Dubai: How does it present? 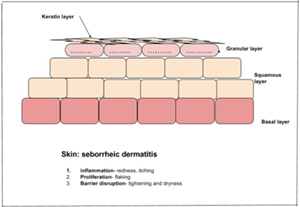 Seborrheic dermatitis is a clinical diagnosis based on the location and appearance of the lesions. The characteristic symptoms—scaling, erythema, and itching—occur most often on the scalp, face, chest, back, axilla, and groin. In infants, there may be thick white or yellow greasy scales on the scalp- called the cradle cap. This is the commonest form of presentation and occurs in 10% baby boys and 9.5% baby girls. It is usually benign and resolves spontaneously. In adolescents and adults, seborrheic dermatitis typically presents as flaky, greasy, erythematous patches on the scalp, nasolabial folds, ears, eyebrows, anterior chest, or upper back. Seborrheic dermatitis in children Dubai: Why does it happen? The skin changes are thought to result from an inflammatory response to a common skin organism, Malassezia yeast. Malassezia is usually found in the skin flora and is a normal finding. Changes in the functioning of the skin cause the redness, itching, and scaling. Nonetheless, in persons with seborrheic dermatitis, the yeast invades the superficial part of the skin and produce fats that result in inflammation. 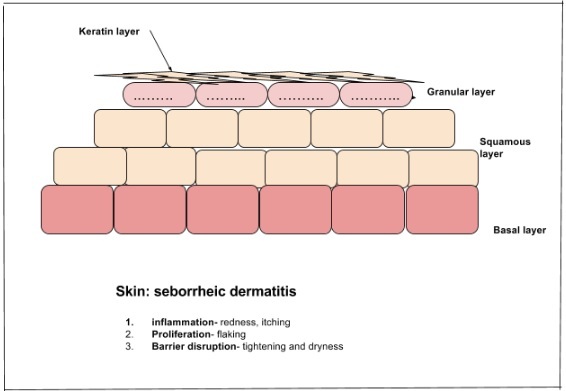 The inflammation causes scaling and impairs the stratum corneum barrier and skin functioning. The severity of symptoms is impacted by stress and sun exposure. Seborrheic dermatitis in children Dubai: How to treat it? Thus treatment includes antifungal, anti-inflammatory and regulation of stratum corneum productions. 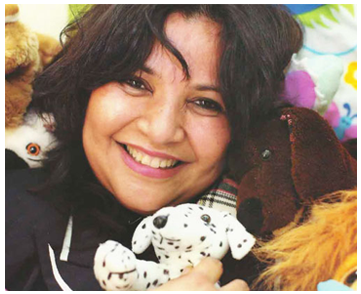 If you like what you have seen or read about seborrheic dermatitis in children Dubai, please share it with your friends by clicking on one of the social media buttons below.